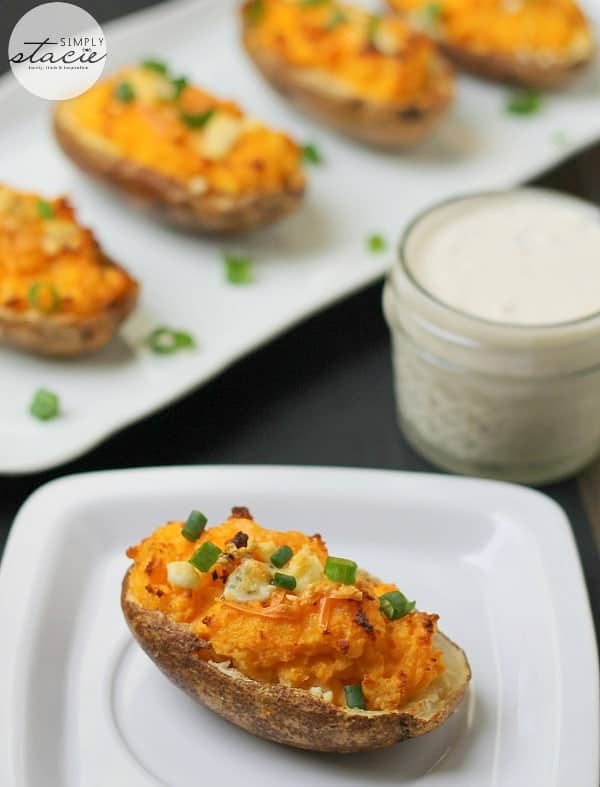 If you enjoy Buffalo chicken wings, you might like this recipe for Buffalo Twice-Baked Potatoes. It’s also a great recipe for game day. 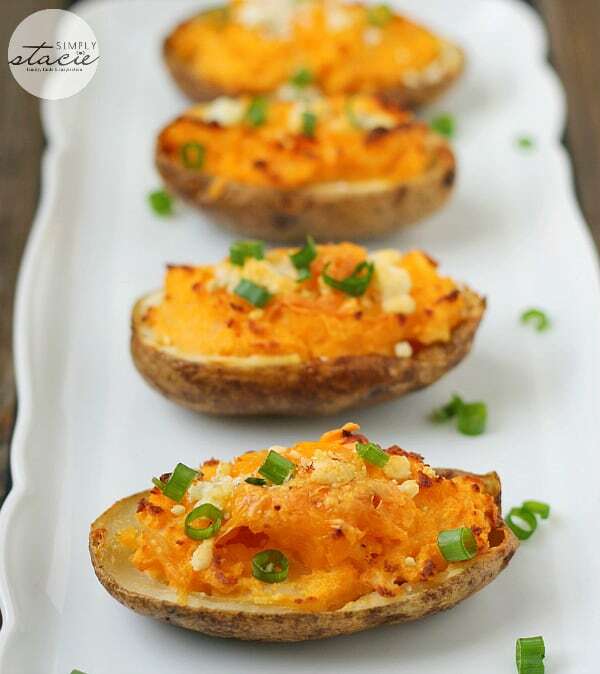 I have a love-hate relationship with twice-baked potatoes. I love to eat them, but I don’t always like to make them. I’ve had many recipe fails where I scoop out too much of the potato and it falls apart. I’m getting better with practice though. Have you had any potato recipe fails? For more Buffalo recipes, try my Buffalo Chicken Sliders. Talk about amazing! This is a perfect side dish for beef or chicken. Preheat the oven to 400F. Place the potatoes on the rack in the centre of the oven and bake for 30 minutes. 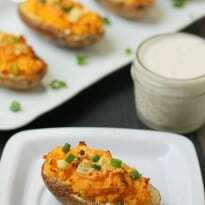 Poke each potato in a couple spots with a fork and continue to bake until tender, about 30 minutes more. Remove potatoes from the oven, and turn the heat down to 375 degrees F.
Holding the potato with an oven-mitt, cut the potatoes in half. Carefully scoop out most of the potato and put into a bowl. Be careful to leave enough potato in the skin so the shells don’t fall apart. 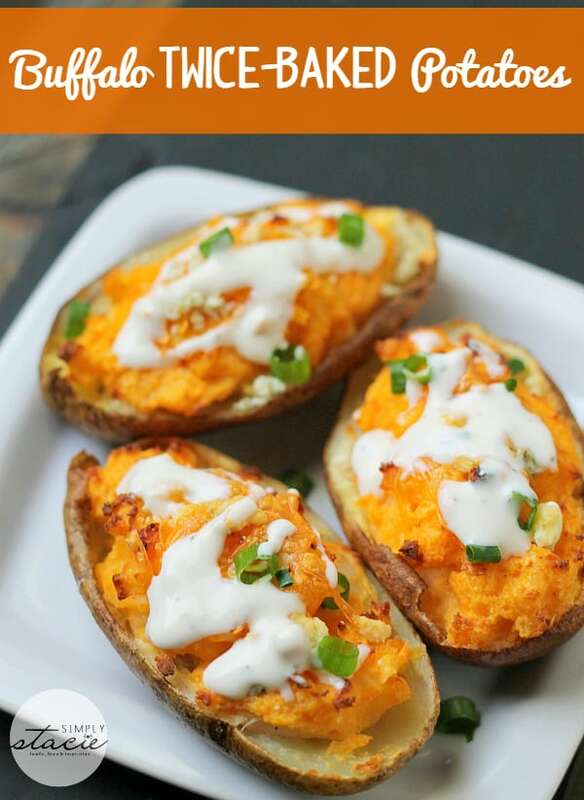 Mash the potato lightly with fork, and add the butter, buffalo sauce and sour cream. Stir in the green onions and cheddar cheese and season with salt and pepper, to taste. Lightly rub olive oil on outside of the skins, and then sprinkle salt and pepper on them. Refill the shells with the potato mixture. Sprinkle Gorgonzola on top. Set the potatoes on a baking sheet, and bake until heated through and cheese melted, about 20 minutes. Serve with a side of ranch or blue cheese dressing for dipping. Enjoy!